The UFB mixer submersible is a, complete unit with the low-pressure mixing valve technique that effectively and efficiently saturates liquids with gases over 5 times the levels of conventional technologies. The unit in the movie is the the UFB mixer submersible 120 and moves 113 liters of water per minute and dissolves 4 liters of oxygen per minute creating a high DO content and ultrafine bubbles in the water. There is also a larger version available the UFB mixer submersible 250. Place the unit in the water, when the water is very deep use a buoy, and submerse the top of the unit 30 cm / 12" underwater. Don't submerse the unit too deep as water pressure increases and performance will be reduced. Connect the gas source with a gas hose, 10 mm or 3/8". Place a gas flow meter to set the gas volume. 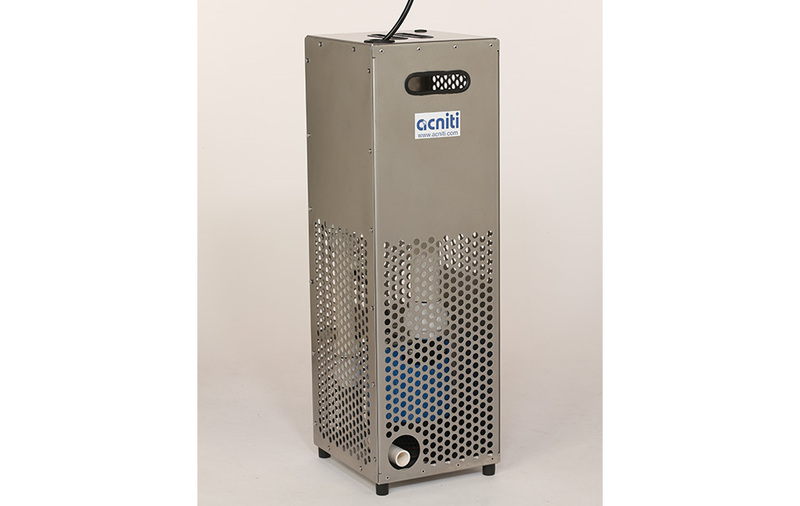 When using a gas bottle, a one-way gas valve is not required, when using an oxygen concentrator connect a one-way valve to avoid water flowing into the unit. The gas hose, the gas flow meter and one-way valve are all included in the unit. Start the unit by turning on the pump and the oxygen source.